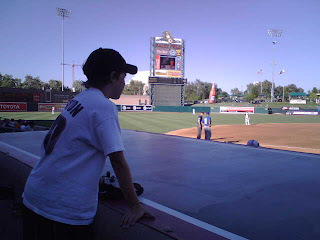 As you can tell from the photo, I went to the Rivercats game on Friday. The only thing I don’t like (aside from the heat) is the annoying kid who got one free baseball from the team and then came back for another one! He stood there for 10 minutes trying to get the attention of any team member. He probably would have had more luck if he knew any of their names. On Saturday, we went to Tex Wasabi’s to celebrate my brother in law’s birthday. My dad insisted that we go there. When my dad insists on going somewhere it has a tendency to turn into a nightmare due to circumstances beyond his control, but we actually had fun. The drinks and food were good. No one had a mental breakdown. My 7 month old nephew didn’t even cry once. Rumor has it that Smashmouth was there having dinner too. Of course, I started singing “All Star” when I was ensconced in my parents’ car. I may have been tipsy, but I didn’t lose all sense of decorum. >Tex Wasabi’s is a restaurant that serves both sushi and barbecue.